Many guitar tuners have graced the pages of The Gadgeteer over the years, but the Roadie is possibly the new benchmark and the only one you’ll want in your gig bag. 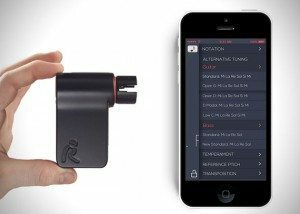 It is a Kickstarter-funded creation that pairs a handheld auto tuner–the Roadie device itself– with a corresponding mobile app. With the app you can save particular tuning schemes as well as save different instrument profiles. Once the Roadie is attached to a tuning peg, simply strum, and it will begin turning the peg automatically until it reaches the selected note from the app. The app can also store information on the string quality, suggest when to restring, and keep instrument maintenance records. Roadie is compatible with electric and acoustic guitars, banjos, ukeleles, and any other instrument with guitar machine heads (it does not work on wooden pegs). The Roadie automatic guitar tuner is currently available for $99. I preordered the Roadie through Grand St last year and ended up canceling my order because I got tired of waiting for it. Now I’m interested again… Morgan did you buy one? @Julie: I was about to click the link and order mine as well–but after your comment, I did a bit more digging. It looks like the Kickstarter backers were getting their shipments Nov/Dec–so maybe there was a slight production delay? I think I’m still going to bite the bullet and order! I’ve played guitar for well over 50 years. My ears are attuned to the correct string sounds. I think being able to tune by ear helps me hear when the guitar goes out of tune during performing. I suppose it might help when I change the tuning for slide guitar. But this feels like a solution in search of a problem. @Sandee I’ve played musical instruments for close to 40 years and do not have the ability to tune by ear. Although I can easily hear when an instrument is out of tune, I can’t get it back in tune without using a tuner. Not everyone has that gift, so consider yourself lucky. I received the Roadie Tuner late last december, as a gift to my son who plays guitar (I drum). It’s great, and @Sandee is missing the other problem it solves: tuning strings differently, on the fly. Pull up the app, choose a setup, put the roadie on the first string, strum, wait a couple of seconds, rince and repeat. Within 30 seconds you have a perfectly retuned guitar for your next song that needs special handling.